The Essence range ... tremendous variety of possible combinations of colours finishes. Grohe's expanded Essence faucet range offers an incredibly rich toolbox for the creative mind with the broadest range of colours, finishes and matching products, claims the premier German sanitary fittings specialist. It allows for a degree of individuality unthinkable before, thus making it well poised to take on the global trend to individuality, it adds. The full Essence range, from faucets to showers and accessories, offers a tremendous variety with 10 possible combinations of deluxe colours and state-of-the-art finishes: Cool Sunrise, Warm Sunset, Hard Graphite and Nickel, which come either with an elegantly brushed or highly polished finish. “They are as beautiful as they sound and work perfectly in high contrast and middle contrast environments as well as in tone-on-tone designs. Inspired by the latest global trends, they were carefully designed to fit into every bathroom style and colour environment,” the spokesman points out. 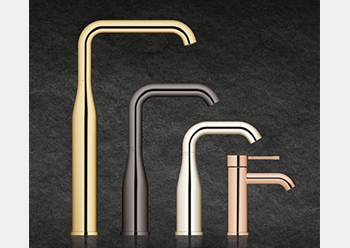 This new freedom of choice in the Essence range comes with an incredible consistency in design, with every spout and lever almost identical across all product types. The luxurious free-standing shower, the floor-mounted bath mixer or premium basin mixer in sizes from S to XL; with matching accessories such as high-end towel rails or soap dishes, they all speak the same design language of subtle and delicate transitions and simple, understated geometry, he adds. The geometric structure is based on concentric cylinders. For the expanded line, it has been slightly softened and humanised, like the redesigned lever. “We have included a very slight taper on the handle, giving the user a sensual experience of precision and control they will never have felt before,” explains Seum. “The introduction of controlled organic transitions will bring harmony to any interior concept, joining the products seamlessly across all zones of the bathroom. This contributes greatly to the overall high flexibility of the expanded Essence range, translating into practically any bathroom style, be it classic luxury, high-end vintage or natural atmosphere of well-being,” he says. The new freedom of choice comes with the well-known, durable Grohe quality and numerous highly advanced technological features such as Grohe AquaGuide and Grohe SilkMove. Essence has won numerous prestigious international awards, such as the Iconic Award Interior Innovation, Good Design Award, and iF Product Design Award, to name a few. Grohe is a world leader in sanitary fittings and has been part of the Lixil Group since 2014. The company has been developing new product categories since its inception, including the Grohe Blue and Red water systems and the recently-introduced Grohe Sense water security system, which is an innovative component in the growth market of smart home technology. Innovation, design and development are closely aligned with one another and are enshrined in the German site as an integrated process, Seum says. In the past 10 years alone, more than 300 design and innovation awards as well as several top rankings at the German Sustainability Award have confirmed Grohe’s success. Grohe is claimed to have been the first in its industry to win the German government’s CSR prize and was also featured in Fortune magazine’s ranking of Top 50 that are “Changing the World”. Grohe has a total of over 6,000 employees, 2,400 of whom are based in Germany.